Saturn, Saturn, and More Saturn! I recently realized that I’d been putting off making a scene of Saturn, even though I knew what I had to do to make it work. Seizing the opportunity to do some work in Layout again, I made a scale reproduction of Saturn, it’s rings, and five or six moons (the ones I found good maps for). I’ve already made similar set-ups for Jupiter and Earth. While I was working on it, I came up with ideas for three pictures using it, so here they are. “Gossamer” is just a beauty shot of the planet. 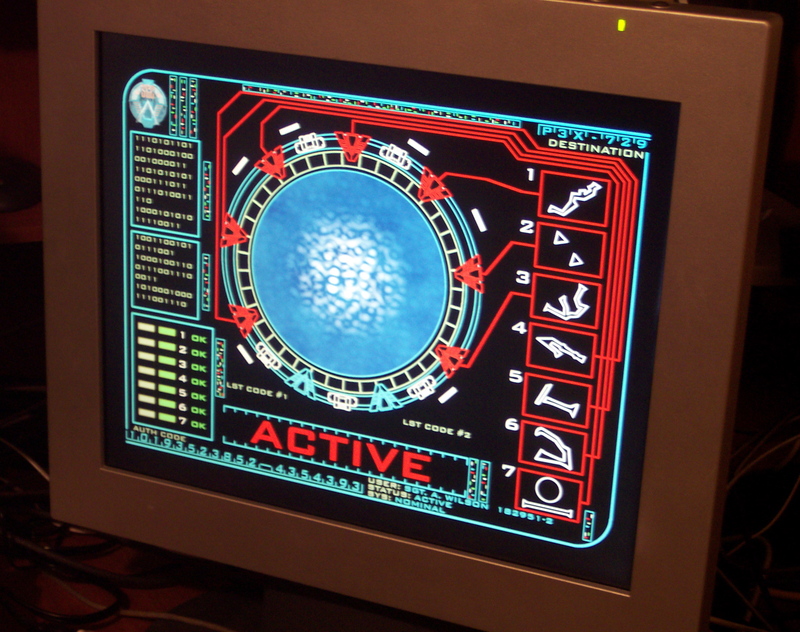 “Take Us Out” is a Star Trek picture that’s something of a riff on the end of the computer game “Starfleet Academy,” where the Enterprise-A is seen in drydock around Saturn. “Ouroboros” is a Stargate SG-1 picture, based off the first season cliffhanger. I felt like the the picture needed a quote, but I couldn’t think of anything specific, so I searched Google for quotes relating to the word “serpent” until I found something that was apropos to the situation. • August 2, 2007 • Comments Off on Saturn, Saturn, and More Saturn! 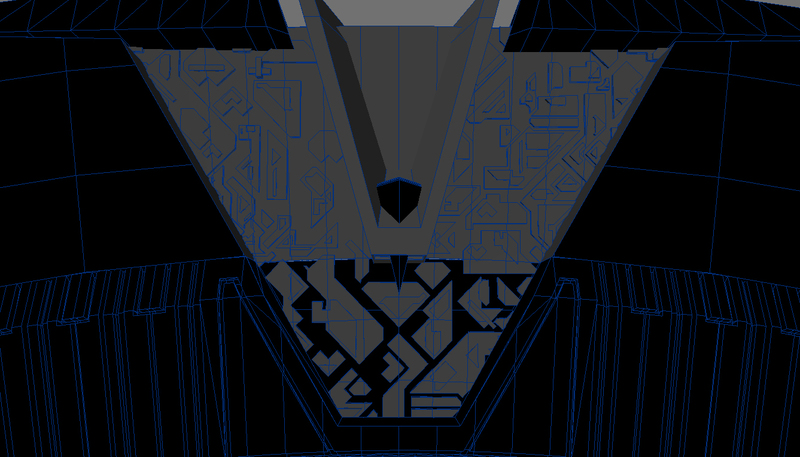 Now that the modeling of the exterior is finished, I believe I have enough invested in it to start up the WIP thread. 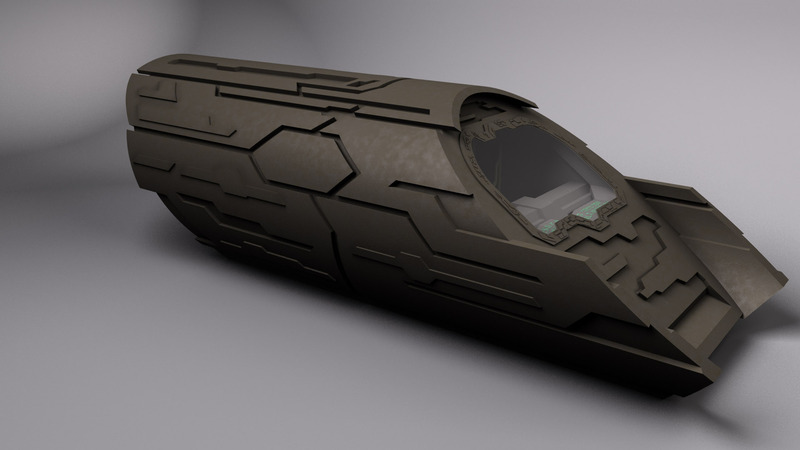 I’ve started on texturing, and I believe I have a good base for the hull texture above. I’m painting alpha maps for it so the mottling isn’t so uniform. 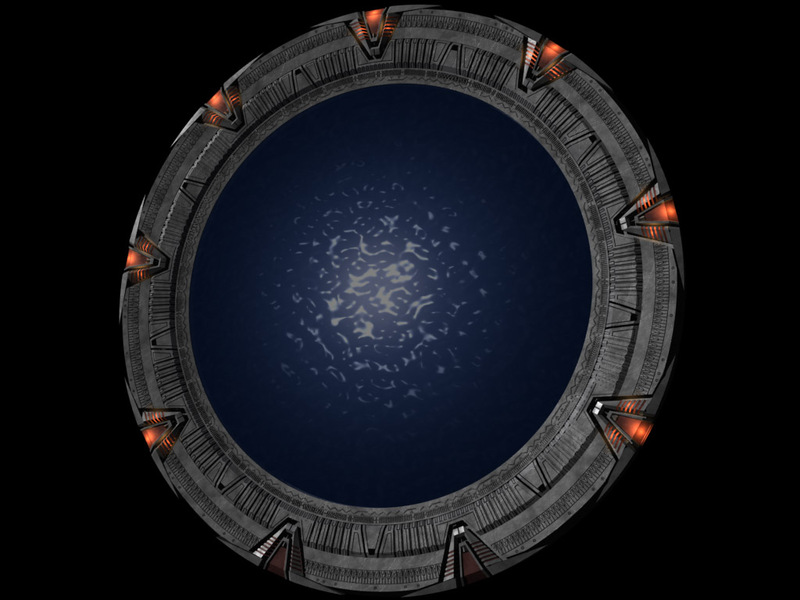 I already finished animating the unfolding of the engines, though I’ll need to work out a new way to clip the objects so they don’t show up inside the cabin of the ship when they’re retracted. 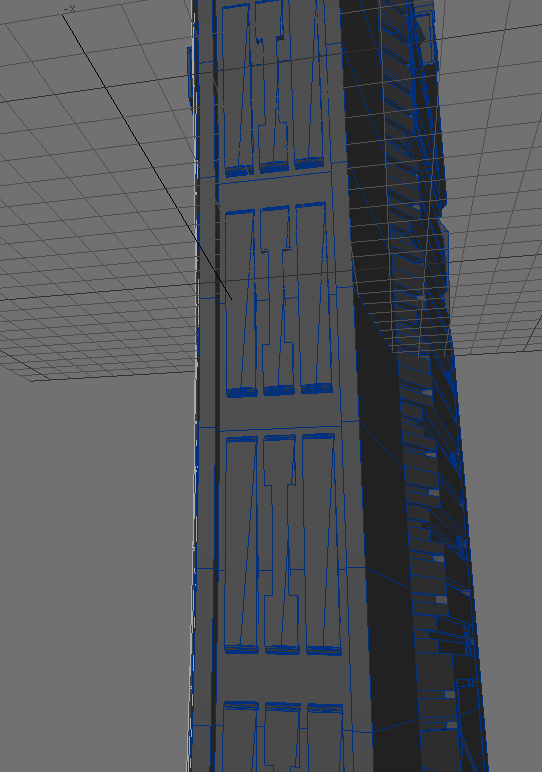 The method I’m using now only works when the ship is pointed along the Z-axis. 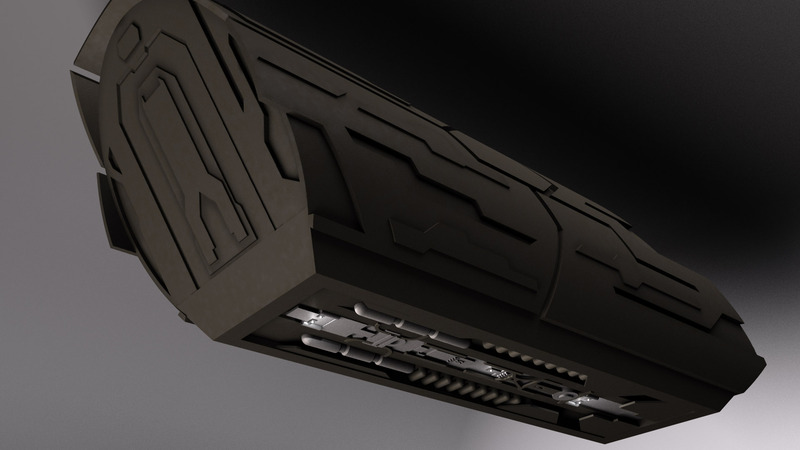 Also, I’ve finished texturing on the drone weapons, complete with a low-detail version for those scenes when you have thousands of the things flying every which way. 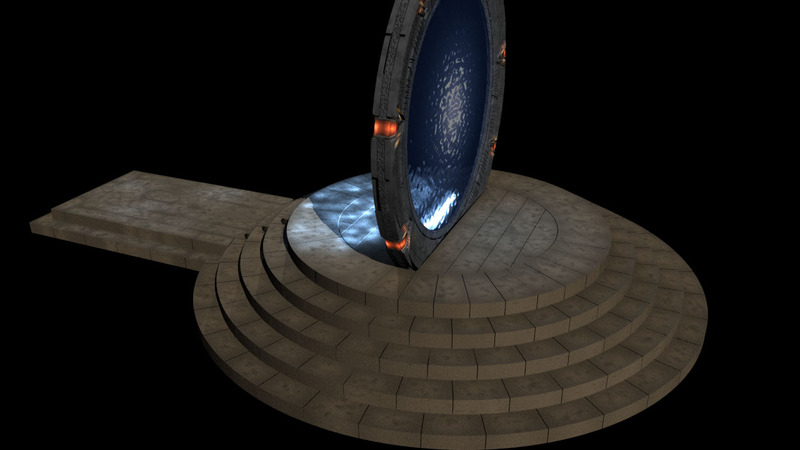 I’ve finished texturing and the light set-up on the exterior. I’m going to try to figure out how to get this clip-mapping fixed, though. 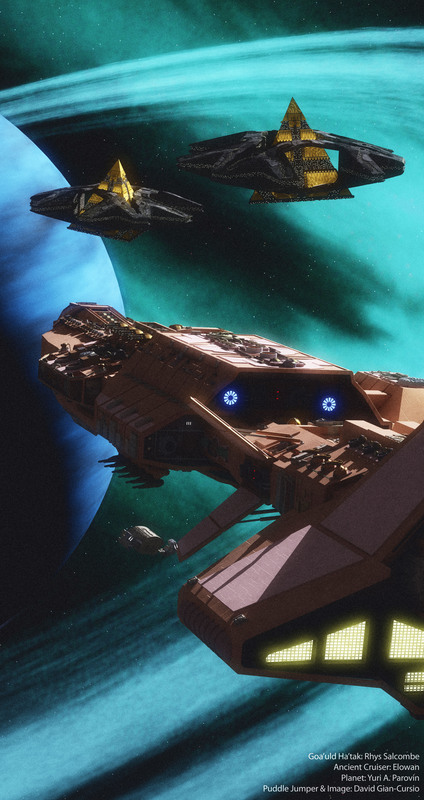 Being able to only point the ship in one direction is a bit limiting for cinematography. 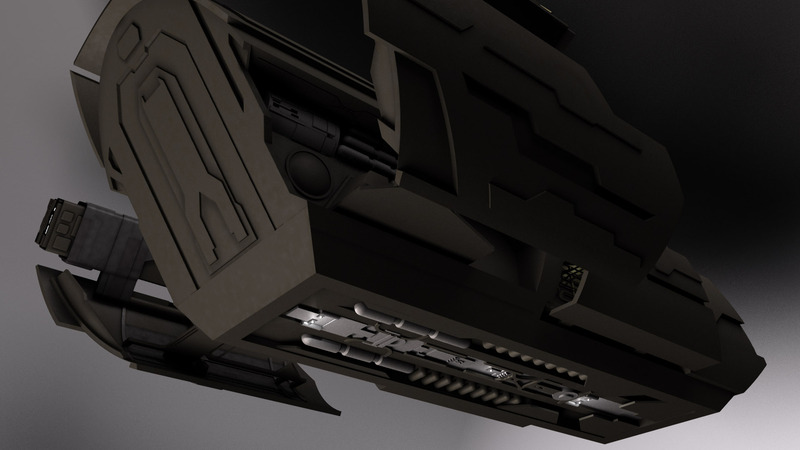 After I’ve gotten that done (or given up in hopes of figuring it out later), I’ll get back to modeling the interior. 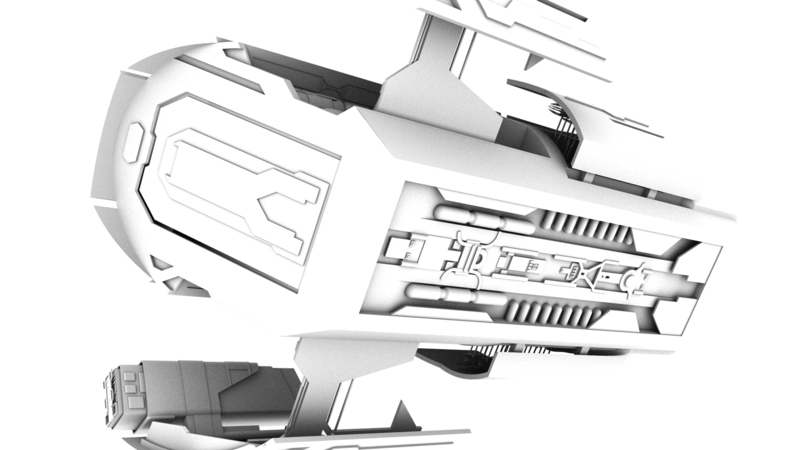 Also, I’ve rigged the engines so I can throttle their brightness with one slider. In fact, with the complicated retractions this ship does, I have to say, sliders and Master Channels are an absolute Godsend. As for the engines on the Jumper, those are a magical wonderland of cheating. The engine bays on the original are about twice as deep as mine (the reason the bays on my model are shallower is so the rear compartment fits in at something close to its actual proportions), so the actual engines fit in with a bit less of a problem. However, it seems clear that the pivot they rest upon jumps off of its track while it’s retracting, so the engines can point straight up. Also, the wings themselves just pull into the body, without any sort of fake compartment or rationalization as to how they could possibly fit into the ship. 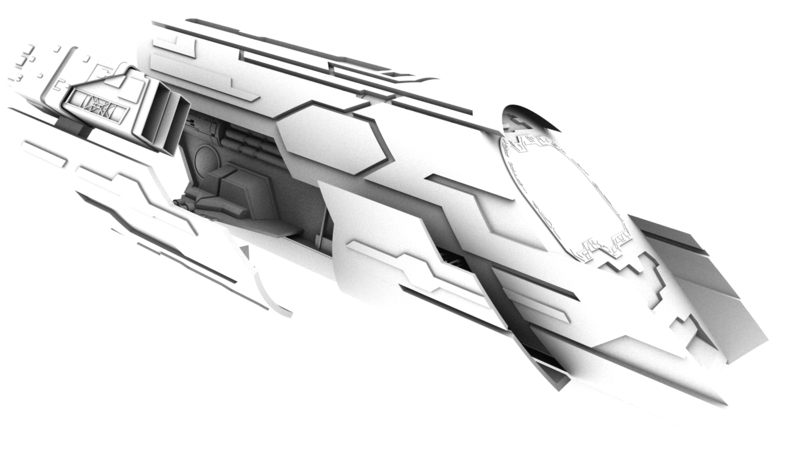 Part of the fun of making this model was realizing exactly what compromises were made in its design, right after I made the same ones and thus knew what to look for. The best look at how the engines retract (and how the VFX artists hide the fact that its physically impossible for them to move the way they do) come in the opening shot of the episode “Trinity,” and in a number of shots in “38 Minutes” (thought the best angles from those episodes aren’t included in those caps). 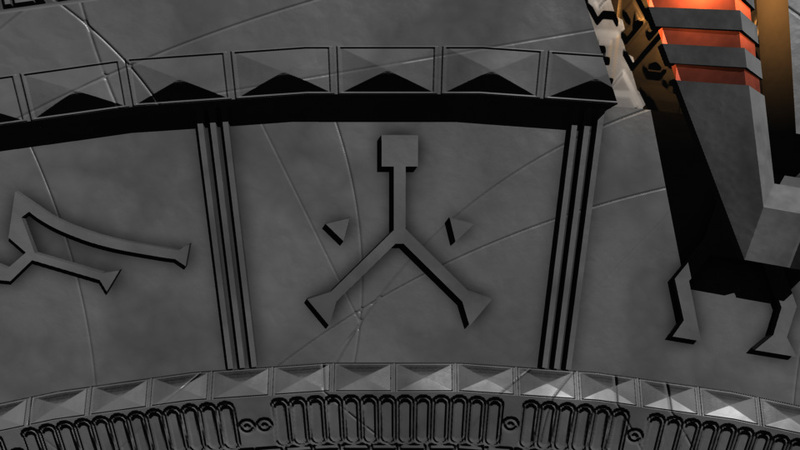 Seriously, after reverse-engineering this whole thing, I’m thinking about doing a writeup on the Jumper, mostly a taxonomy of the 3+ distinct 3D models of done on the show. Here’s a movie of the cycles for the drone and engine bays. I’ve already decided I’ll take a page from the Atlantis VFX teams and only show the engines unfolding while the ship is distant, in motion, in shadow, or all three. 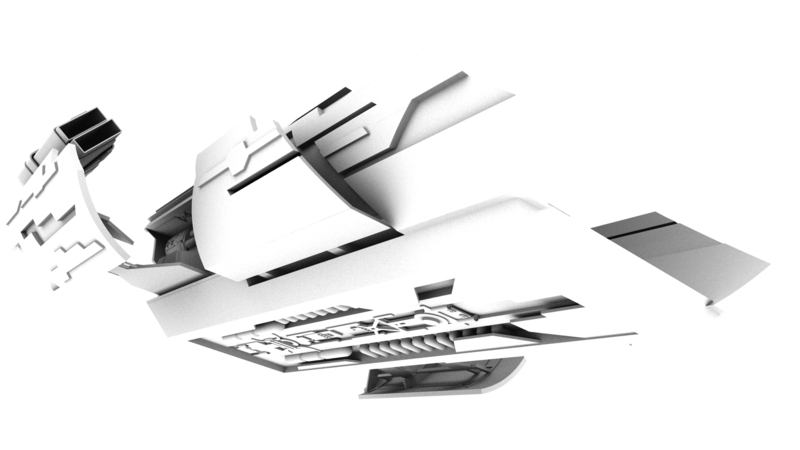 The same movie as above, but with the main body of the ship hidden so you can see precisely how the engines have to be clipped out so they don’t show up inside the cabin. 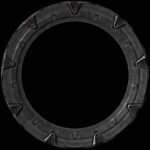 If you’re making you’re own Stargate and are using mine as reference, here are some larger, detailed renders, as well as information on certain details of note that aren’t entirely visible in the showcase renders. 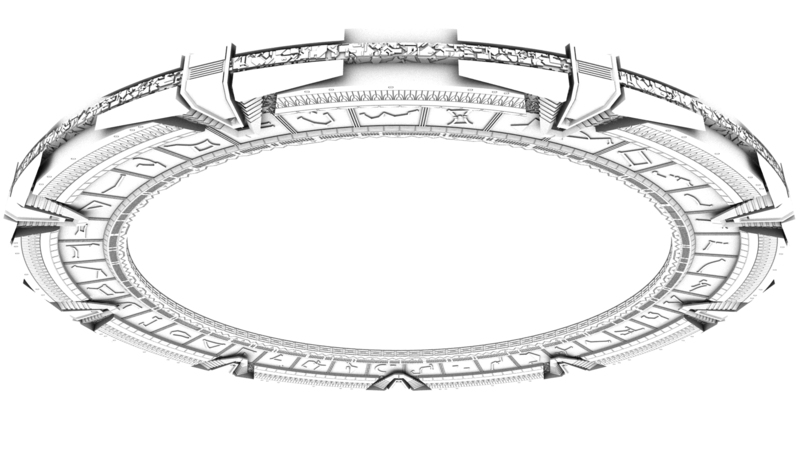 The cross-section of the Stargate model. It’s difficult to determine how thick the cross-section is with any sort of confidence, and as I said above, the shape is slightly off, but it lets you see how the shape breaks down. 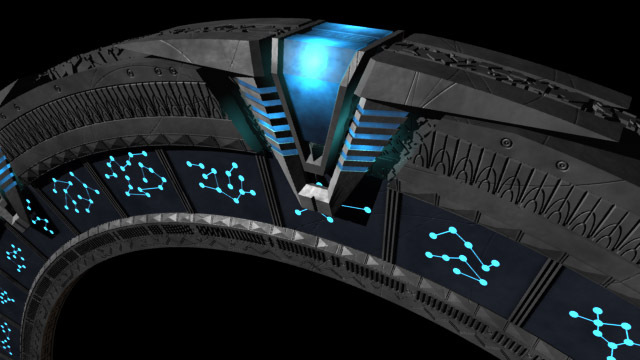 Along the inner edge of the Stargate is this series of raised details. 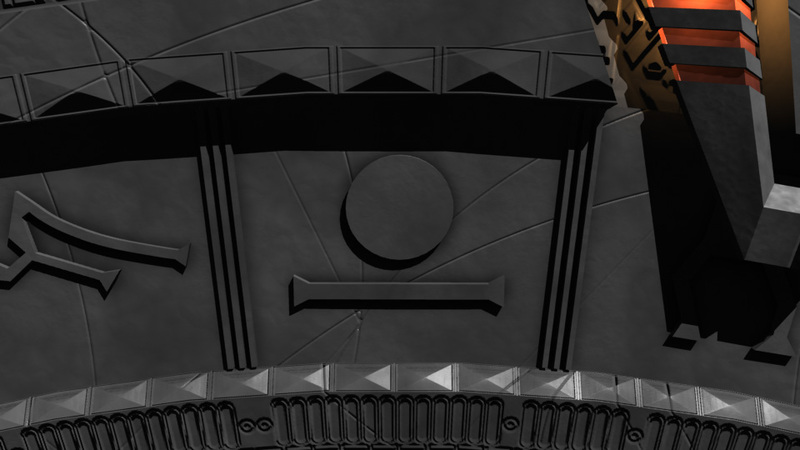 There’s a pattern of raised blocks at the inside of each chevron slot, as well as along the outer edge of the gate. 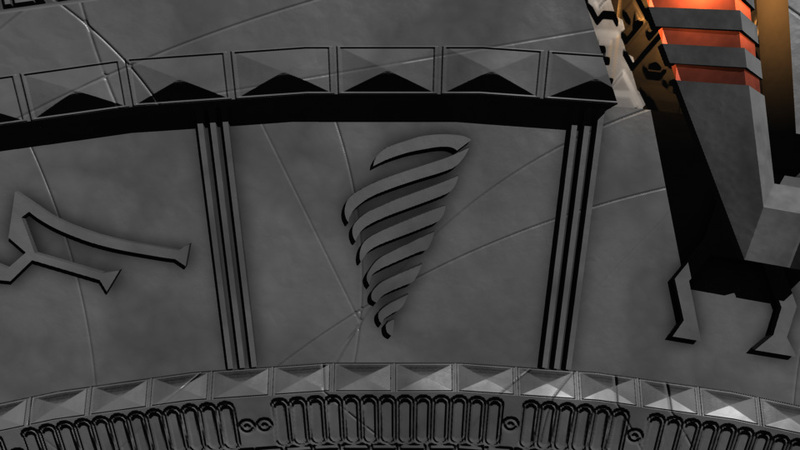 This is mostly conjectural on my model, since all of the pictures of that area are blocked by the chevrons themselves. However this does look right, so it’s a good reference in that respect. 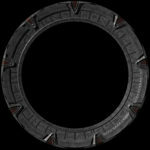 Most Stargate models, from what I’ve seen, are based on an inaccurate listing of the glyphs. 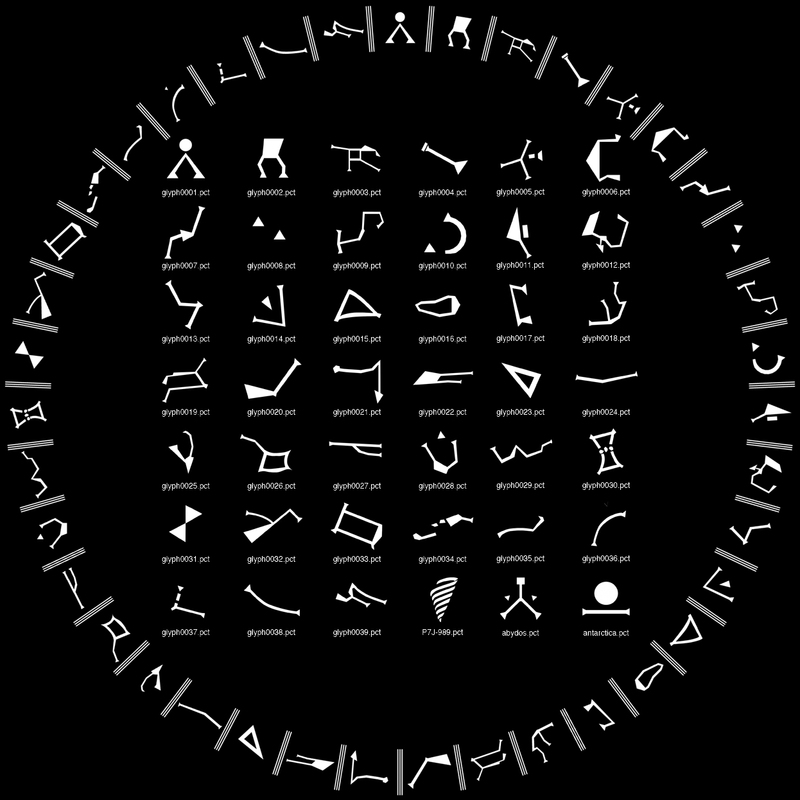 I went back to the Gate used on the show, and created my glyphs from that primary reference, making this list more accurate in both shape and orientation of each Glyph. 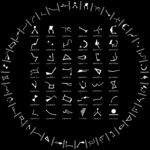 I’ve also included the three canonical Point of Origin symbols that were seen on the show, other than the typical pyramid-under-a-sun. 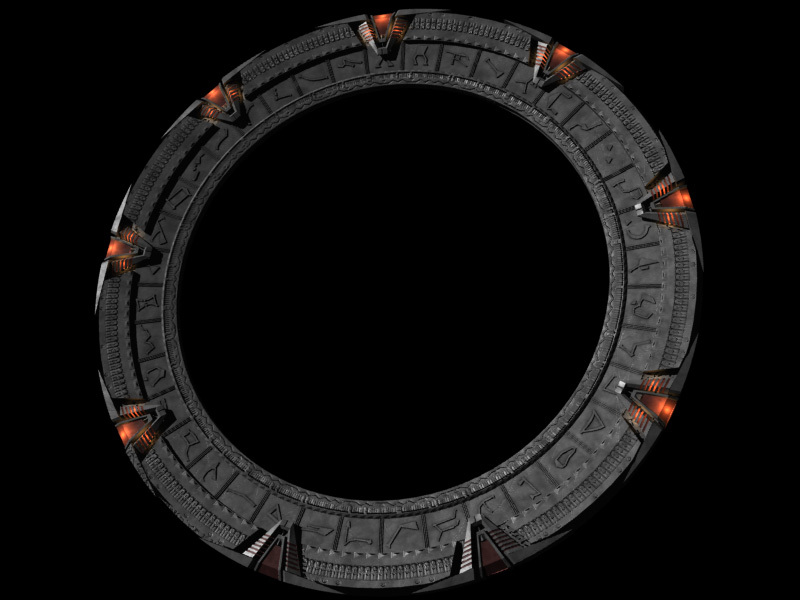 A high-res rear view of my Stargate. 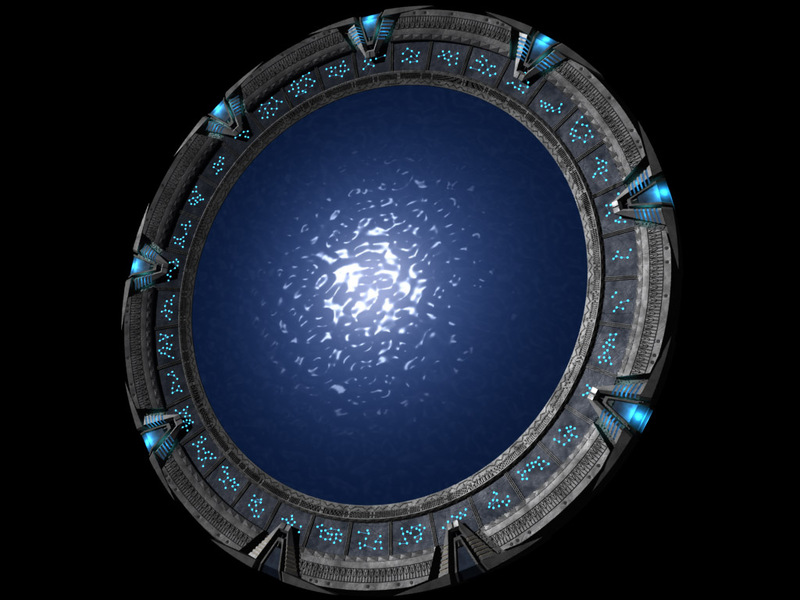 A high-res front view of the Stargate. 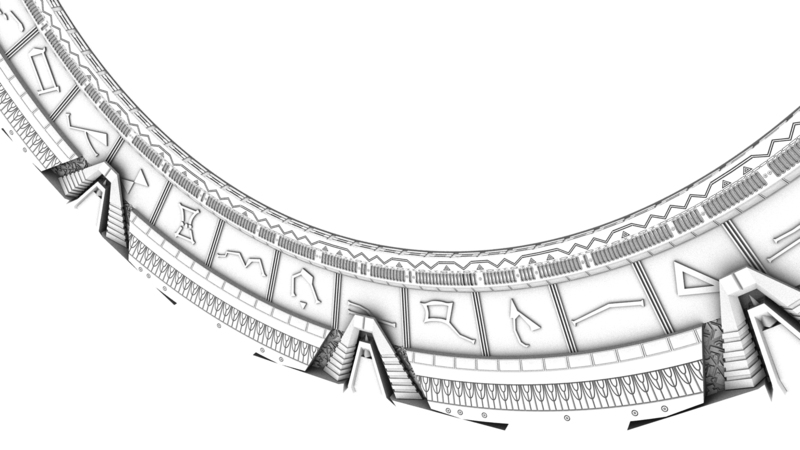 The series of recessed details (three tracks, one of ovals and circles, one of repeating rectangles, and one of a pair of parallel lines traveling straight or in a triangle) on the innermost portion of the ring repeats, but I don’t precisely recall at what intervals, and I believe I fudged it slightly on the model. 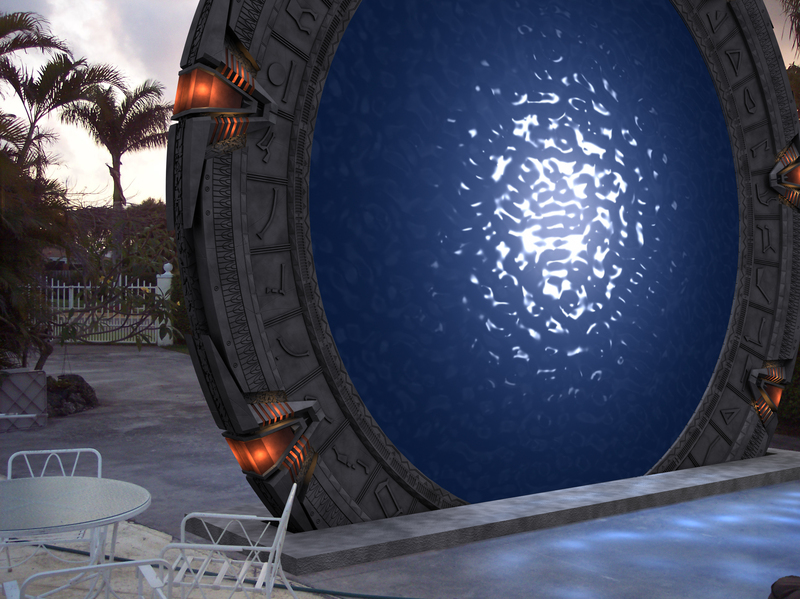 The original photo of the Atlantis Gate, retouched for 360º coverage. 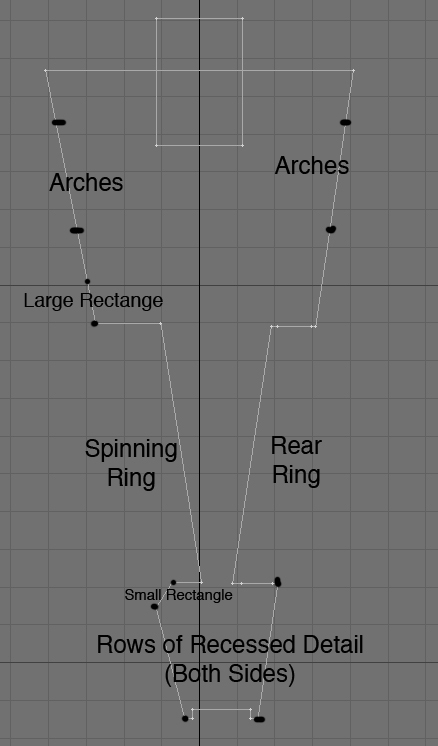 I recommend using this as a template, instead of my model, to get the most accurate overall shape possible. First, and most importantly, my Stargate is slightly thicker than it should be. I only noticed this by comparing it to a reference picture after I had done too much work to be able to go back and fix it. 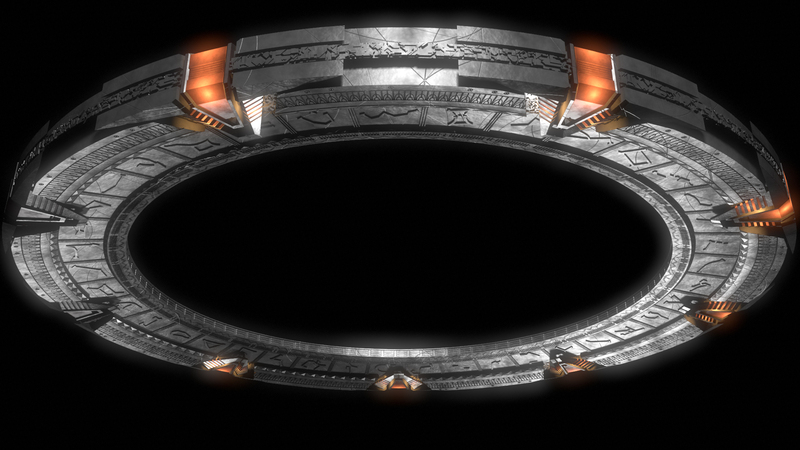 This is a comparison of the Atlantis Stargate prop with my model. 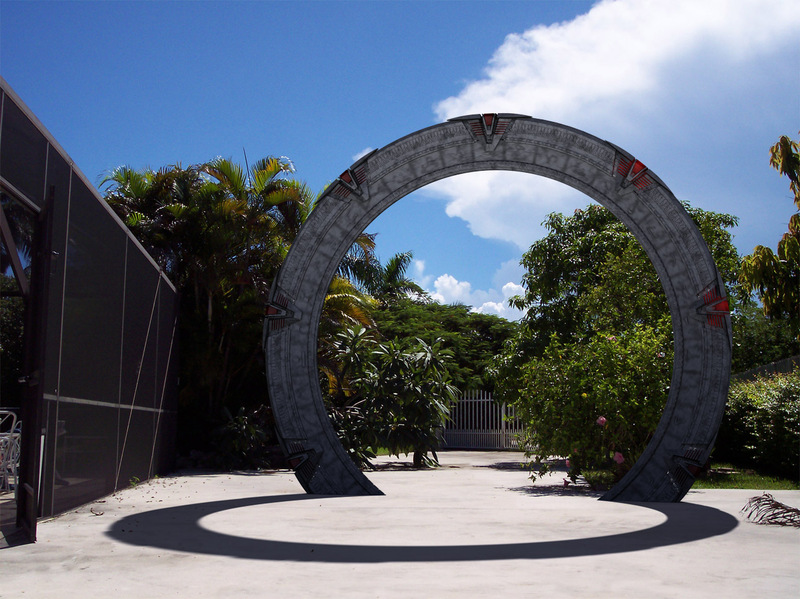 Since I have a new, better Stargate model, I decided to do a new, better version of the only real picture I made with my first Stargate model, namely the ‘gate in my backyard. 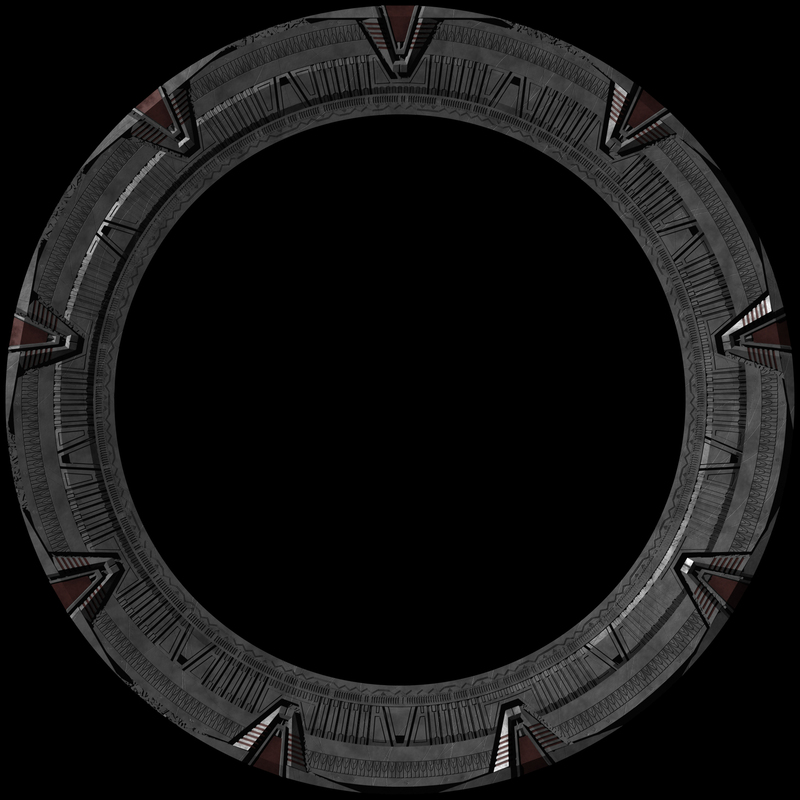 I also added a little something to allow the inner ring to spin freely. I’m not 100% happy with where the rendered concrete meets the real concrete, and something seems off about the scale and/or perspective of it, but I don’t know how to deal with that. …and it’s about danged time, too! Well, I’ve been lazy about putting everything together, and I didn’t want to advertise the model until it was ready to go out, but now it is. 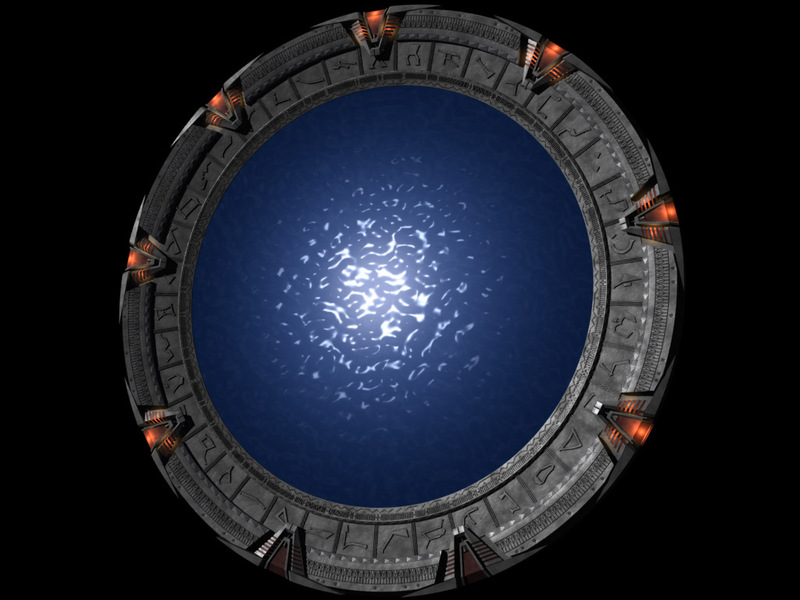 Anyway, I’ve remodeled my Stargate from scratch, and I do believe it is far superior now in accuracy, detail, and general prettiness. First, to refresh your memory check out the old version. Now, get a load of the new version, in all its glory. This uses the lighting setup and cove object from the LWG, by Jason T and Lightwave7871. And, after using it, it’s the only way to show off your models. Well, if you’re me, at least. 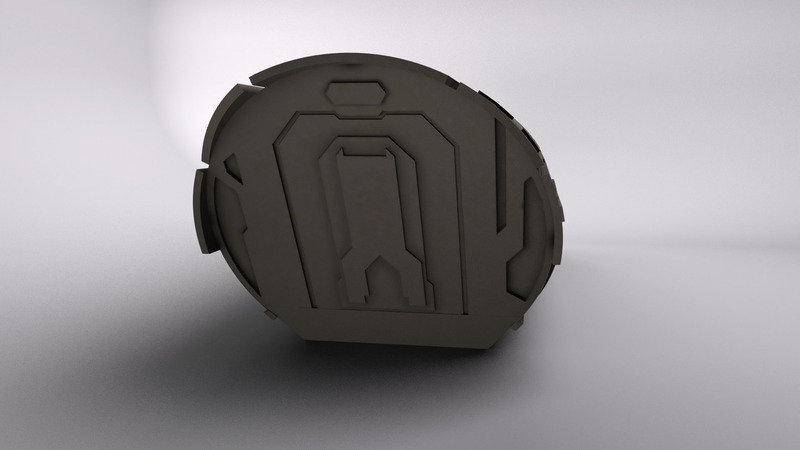 Gad, it just brings everything right out on the modeled details and textures. 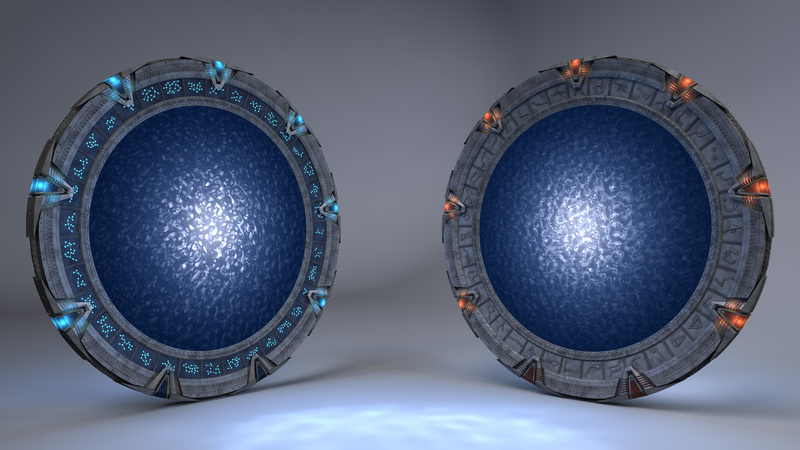 There are three versions of the main model, a low, medium, and high-detail version. Now, some of these next images were made while the model was still being fined tuned, so there may be minor details that are different. And, don’t forget it’s animatable. You’ll need an up-to-date version of Quicktime to view these. 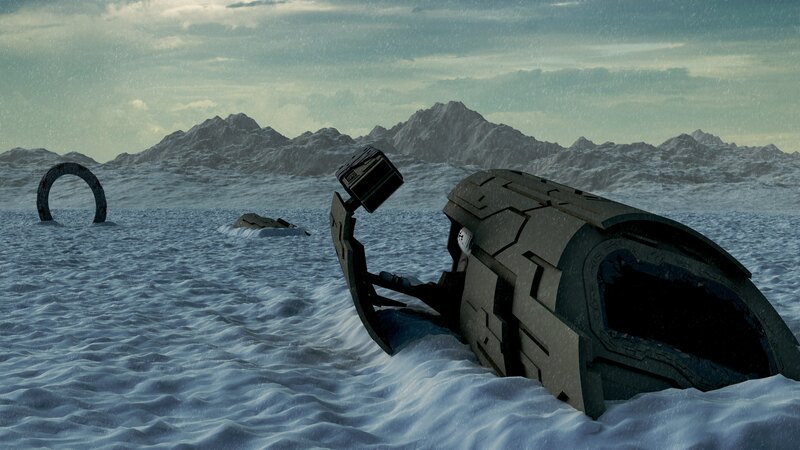 While I have done a few experiments with compositing, this is probably my most ambitious effor. 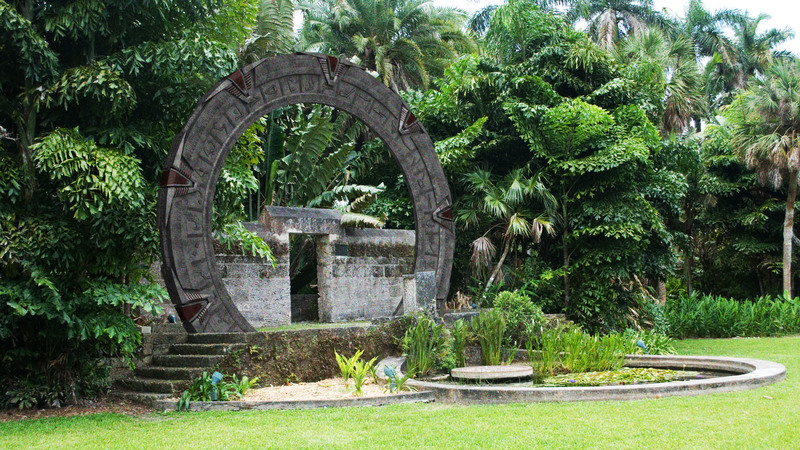 In case you’re wondering, that is my back yard (currently, and delightfully, hurricane free), with my new Stargate model placed in it. 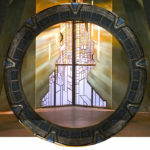 Perhaps SG-1 could come through that ‘gate some time. A nice, (if slightly overdeveloped) piece of the subtropics would certainly relieve the monotony of all those pine-tree planets. Now all I need is a real one to put back there, to see how close I was to reality. I did the compositing in Lightwave. I set it up to do that thing where it makes an alpha map for the ground stand-in based on the amount of shadows, just in case. 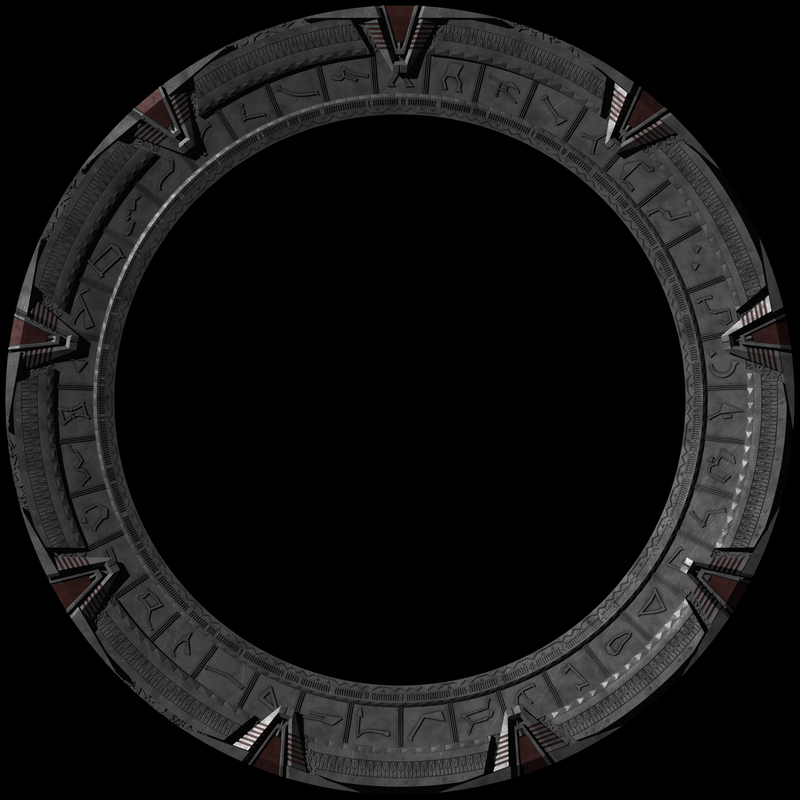 I only have Photoshop Elements (which happens to be missing the Element of alpha channels), but I was able to use a copy on one of the computers at school to make a transparent image of the ring and its shadow, so all that remains is to reintegrate it into my original background and tweak it up a bit. 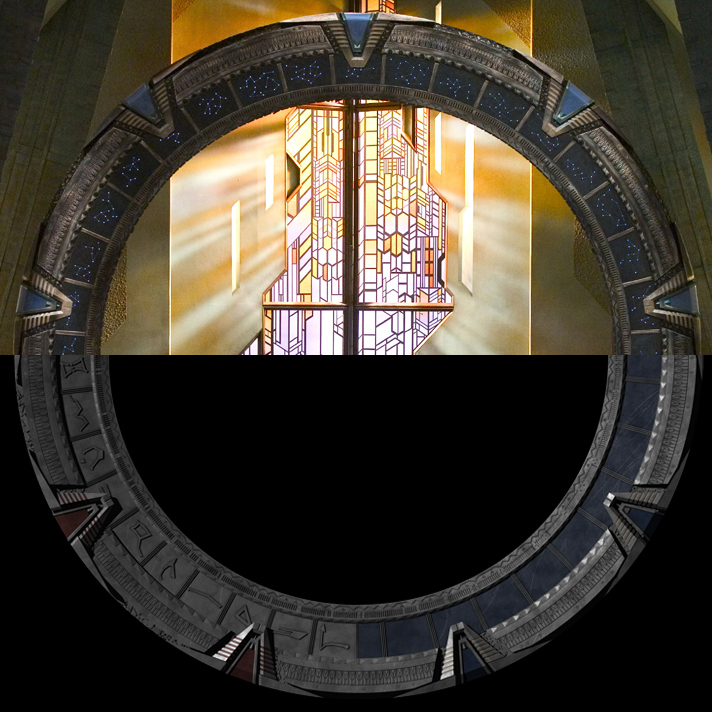 Another thing I noticed was that on the school PC’s monitor, the blue cast (caused by the light I used to simulate the glow of the sky) on the ground object (and the devision between it and the real background) was a lot more noticeable, and the shadow of the ring was a lot lighter. So while I’m most concerned with getting it to look right on my Mac, I may have to see if I can steal some more time at school to find a happy medium. 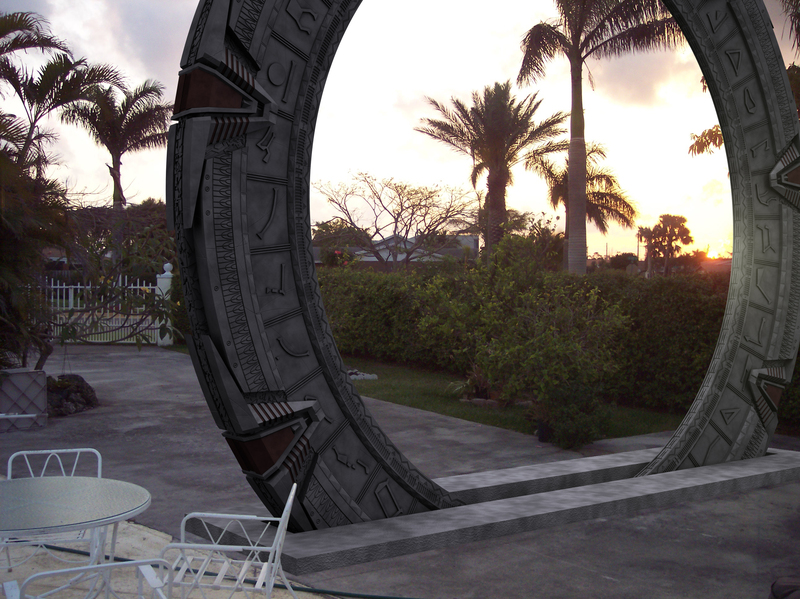 I rerendered the scene with a slightly modified ‘gate model (fixing a spot of missing detail on the back and adding a more accurate bit of detail to the inside surface, where the event horizon sits), and a slightly modified lighting scheme (I tried throwing a little more specular on it from the sun, but found the only way to get even a little to show was to have the light point straight down, which wouldn’t have fit in with the shadows all that well). 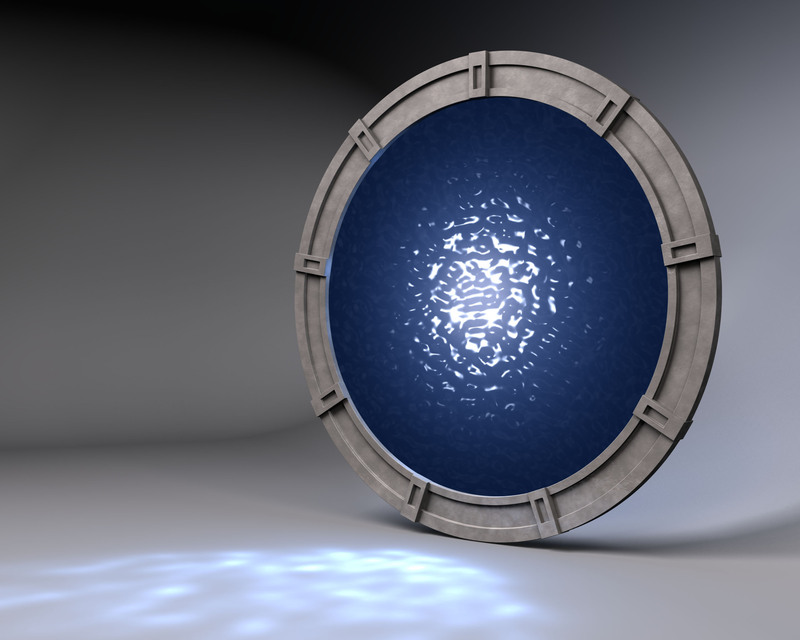 I then recomposited the ‘gate in Photoshop, getting rid of the blue cast on my front-projection polygon. 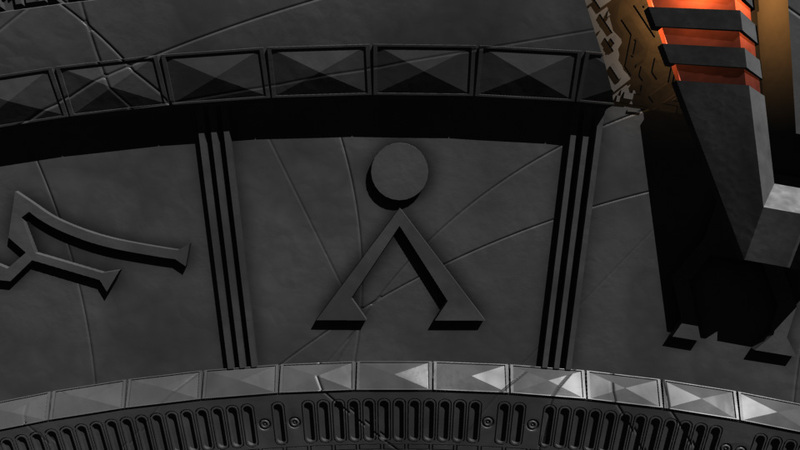 Only problem that remains is that the bump mapping in the chevron wells is having some kind of difficulty, causing the background to shine through as if it were partially transparent there. 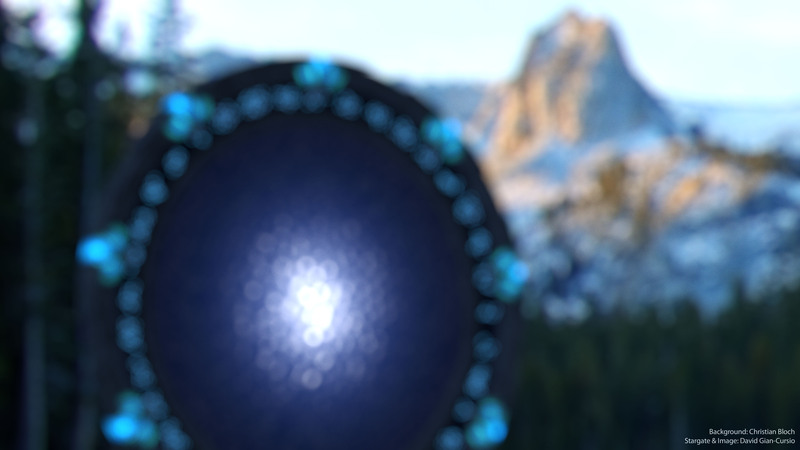 I’ve no idea how or why, and it doesn’t show up on the alpha map of the image. 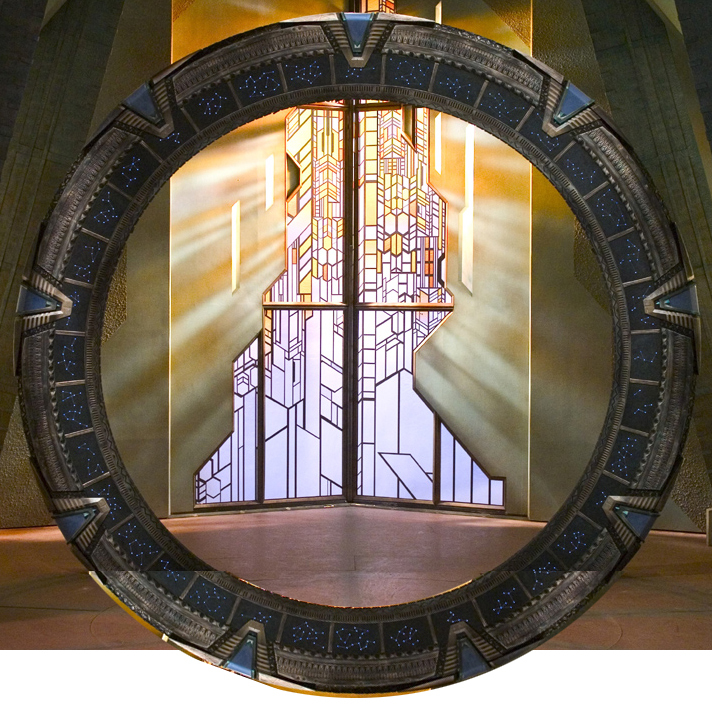 In summery, I think it would’ve been far easier to go to Canada, steal the prop, and instal it in my driveway, then say it was a comp-job when I posted the pictures of it. It would also be endless fun at parties.